London Welsh head coach Lyn Jones believes that Welsh coaches, players and support staff will continue to be courted by other countries. 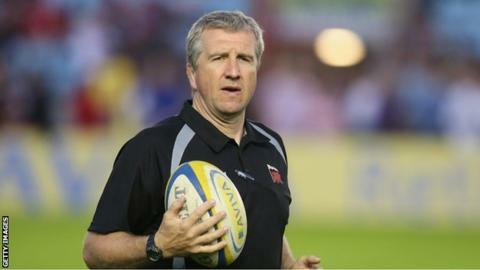 Former Ospreys boss Jones is one of three Welshmen coaching in England's 12-team Aviva Premiership. Dai Young at London Wasps and Nigel Davies at Gloucester are the other two. "The education and the coaching courses that the [Welsh Rugby] Union have put on over the years have been a very good quality," Jones said. "It's not just rugby coaches, it's rugby players, it's conditioning coaches, it's analysis, it's everything to do with the professional game of rugby. "In Wales there is a good system where we are developing not just on the field but off the field as well. "When you grow too big for something you move on and England and further afield are targets. "It's interesting to see that the analysis gentleman [Alistair Rogers] with New Zealand is from Port Talbot as well, so it goes on and on." Welsh players have often been courted by English and French clubs in particular, with several of the current crop of Test players currently plying their trade in the French Top 14 championship. The departure of leading coaches from Wales is relatively recent but seems set to continue, especially as Wales has just four professional regional teams - limiting opportunities for ambitious coaches and backroom staff.